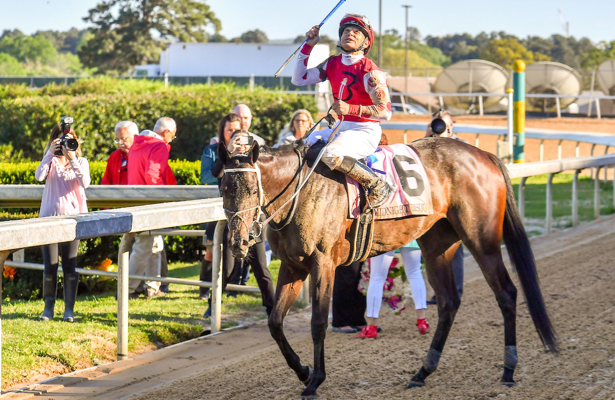 Monday's edition of the NTRA Top Thoroughbred Poll saw Grade 1 winner Bricks and Mortar hold onto the lead spot for a second straight week with 11 first-place votes and 341 points. Santa Anita Handicap winner Gift Box (6 first-place votes, 323 points) also held steady in second with the biggest mover being Midnight Bisou (2 first-place votes, 261 points), who improved from seventh to third on the strength of her narrow victory in the Grade 1 Apple Blossom Handicap this past Sunday. McKinzie (1 first-place vote, 241 points) is fourth with champion Monomoy Girl (7 first-place votes, 239 points) fifth. City of Light (11 first-place votes, 168 points) is tied for sixth with champion male sprinter Roy H (168) followed by Dubai World Cup winner Thunder Snow (IRE) (5 first-place votes, 119 points) in eighth. World of Trouble (111 points) and X Y Jet (1 first-place vote, 110 points) round out the top 10. Rushing Fall (58 points), Mitole (43 points), and Omaha Beach (27 points) each earned a single first-place vote. The NTRA Top Thoroughbred Poll is the sport’s most comprehensive surveys of experts. Every week eligible journalists and broadcasters cast votes for their top 10 horses, with points awarded on a 10-9-8-7-6-5-4-3-2-1 basis. All horses that have raced in the U.S., are in training in the U.S., or are known to be pointing to a major event in the U.S. are eligible for the NTRA Top Thoroughbred Poll. The full results for the NTRA Thoroughbred Poll can be found at the NTRA website.